Scientists at the Centre for Genomic Regulation (CRG) and August Pi i Sunyer Biomedical Research Institute (IDIBAPS) have made a first-ever identification of the alterations in the neuronal circuit that impact cerebral cortex physiology, and that could be the cause of cognitive deficits in Down Syndrome. The study, published in the latest edition of the Journal of Neuroscience, explains how a gene linked to Down Syndrome is associated with altered oscillations in the cerebral cortex, the region responsible for our capacity for reasoning, language and social behavior. 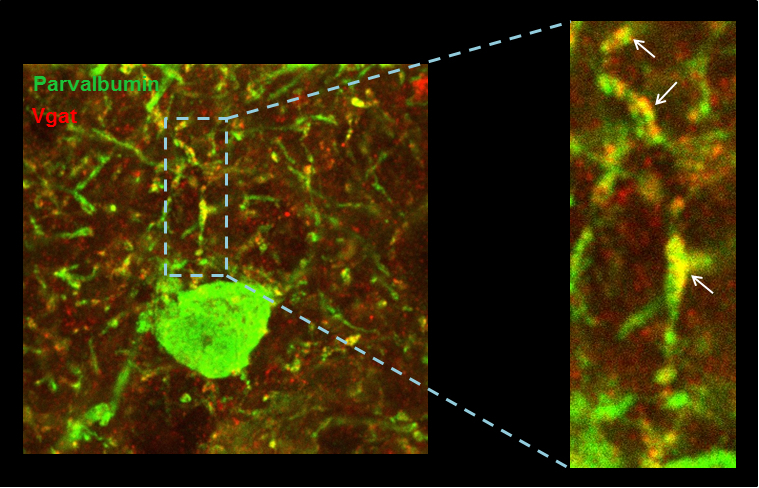 Cerebral activity is governed by a fine balance between neuronal excitation and inhibition. Specifically, neurons are activated by excitation mechanisms tightly regulated by inhibition processes. For certain functions, the neuronal network needs to be synchronized. This causes high-frequency oscillations that make behavior and information-processing possible. This synchronization depends on the excitation/inhibition balance that is affected in a significant number of disorders that involve cognitive dysfunction. In an article published in the current issue of the Journal of Neuroscience, scientists from the Centre for Genomic Regulation, led by Dr. Mara Dierssen, and the laboratory of Dr. Mavi Sánchez Vives, at the Biomedical Research Institute (IDIBAPS), describe altered oscillations and synchronization in the cerebral cortex for a Down syndrome candidate gene in a mouse model. Such alterations have been linked to problems with functions as relevant as decision-making, impulsiveness, working memory or attention. “Changes in the cellular architecture of neurons in the cerebral cortex, in Down syndrome animal models had already been detected in the past. We observed that the neurons had a different structure. Now we have taken another step, studying the physiology, or the function of this cerebral cortex, and found that those cellular alterations and slight changes in inhibitory connectivity translate into a deficit of activation of this region and of its neuronal activity rhythm and synchronization,” states Dr. Mara Dierssen, head of the Cellular and Systems Neurobiology group and Co-Principal Investigator of this study. “One of the main problems with mental impairment is that we don't understand how the alterations that we detect at the cellular level trigger changes in the cerebral circuits and alterations in cognitive function. The study that we've published explains some of these cellular alterations and offers for the first time an in vivo study of the physiology of the cerebral cortex, a key structure in executive functions such as concentration, learning or problem-solving." she adds. The researchers focused on one of the genes related with Down syndrome. Using experiments on animal models that overexpress the candidate gene, the researchers have shown that an excess of this gene causes very subtle changes in the excitation/inhibition balance, and these lead to a significant diminishment of the activity and synchronization of excitatory neurons in the prefrontal cortex. In other words, when this gene is over-expressed, it reduces the discharge level of the neurons and alters the oscillation of high-frequency waves in the cerebral cortex. Not only that, they observed that the problem originates in neurons responsible for controlling inhibition. In short, if there is less activity and an imbalance in the frequencies of the cerebral waves in Down syndrome it could be due to changes in the connectivity of neurons that should control them. The study combined experiments in electrophysiology and histology with a computational model that virtually emulates the neuronal circuit of the cerebral cortex. “We've identified anatomical and functional alterations and, using a computational model, we've shown how these deficits could explain experimental observations," says Dr. Sánchez Vives, head of the Systems Neurosciences team and Co-Principal Investigador of this paper. “The computational model has made it possible for us to understand the entire mechanism. We can make predictions on how the cerebral cortex functions in this pathology, and how the alterations detected will impact cognitive function," concludes the researcher. This study, the lead authors of which are Marcel Ruiz-Mejias of IDIBAPS and María Martínez de Lagrán of the CRG, has also been participated in by researchers from Pompeu Fabra University, the Pablo de Olavide University and the Istituto Superiore di Sanità in Rome.